No. 11 Crespi overcame a 19-2 face-off deficit against visiting St. John Bosco on Friday to post an 11-6 nonleague win over the No. 15 Braves. Junior Mitch Myers was his usual dominant force at the face-off X for Bosco, but the Crespi defense, anchored by senior goalie Jimmy Acheson (11 saves) managed to limit the damage. Fortunately for the Celts (4-4), the Braves’ mistakes were plentiful. Bosco (5-2), in only its second year as a CIF program and with six freshmen and only one senior on the roster, committed 21 turnovers, 13 in the first half. That helped Crespi build a 5-0 lead before the Braves got on the board. The Celts led 6-2 at halftime. It was Bosco’s second consecutive loss to a ranked team. After starting the season with five consecutive victories, the Braves have lost to Mira Costa and now Crespi. But coach Chris Jewett says his young squad is making progress. Junior midfielder Myles Dolphin scored two of his three goals to open the third period, pulling St. John Bosco within two at 6-4, but Crespi junior Logan Soelberg answered to make it 7-4. Myles’ twin brother Isaiah Dolphin then cut the margin to two again, but Soelberg tacked on two more to give Crespi a 9-5 lead heading to the fourth quarter. 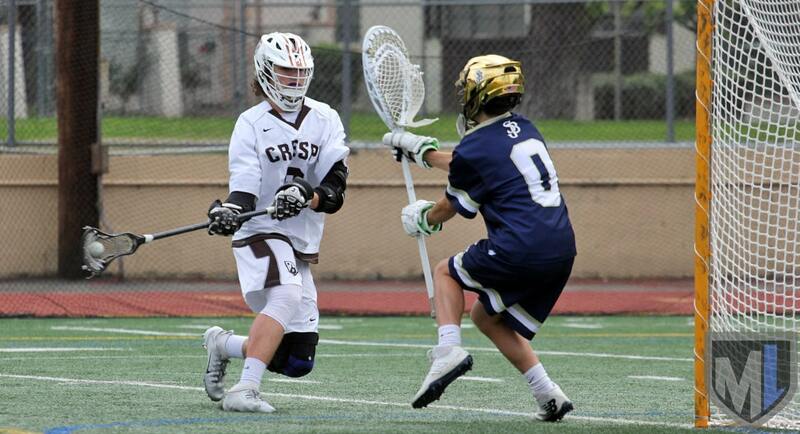 Soelberg finished with six goals for Crespi, and freshman attack Luken McGuire had two goals and an assist. Senior attack Bradley Barberie (pictured above) had one goal and three assists. Sophomores Miles Mathews and Owen Barberie each scored one for the Celts. Myers and Anthony Carieri also had goals for St. John Bosco. Goalie Jake Snider was credited with nine saves.